A local Rickshaw Ride in the busy streets of Delhi & Jaipur is an experience on its own. If you are a real adventure seeker and wish to go deep into the Indian cultures, then a cycle rickshaw ride is a must. With a seating capacity of two people and at max three, a cycle rickshaw is essentially a modification of the standard bicycle with the driver on the main seat and the passengers in a small cabin at the back. More importantly, a rickshaw ride is the most economical means of transport within the periphery of a locality. The Tonga Rideserves as an important attraction for all tourists especially in cities like Agra owing to its affordability and feasibility for travel within the city. Not to forget its specialty of being a horse cart not much different than the cycle rickshaw except for the horse aspect. The cabin accommodating the travellers is generally big enough to accommodate 3-4 people and the rider monitors the movement of the horse. 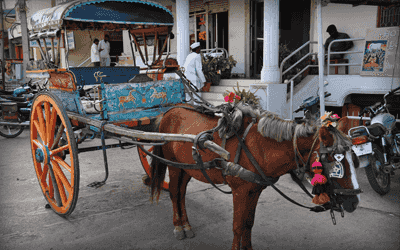 If you truly feel like a royal, opt for an amusing way of getting around the city by riding a Tonga. Elephant Rides are specific to very few countries, India being one of them. It is a unique opportunity for any traveller to ride on a thing so big while twirling at regular intervals due to the uncertain movements of the elephant. Contrary to popular belief, riding on this mammal is safe enough for all the two/three passengers sitting on the usually traditionally decorated elephant, firstly because of the training provided to the elephant and also because there is always a master who guides the motion of the animal. 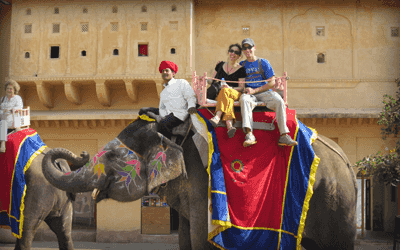 This is one of the main highlight and fantastic experience of your India tour by riding an elephant up the hill to the main entrance of Amber Fort. 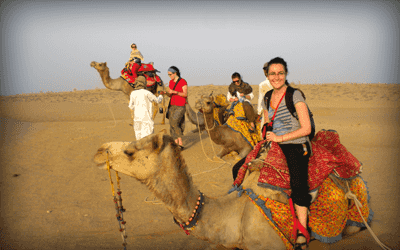 It would be unfortunate to miss out on the groovy camel rides of the beautiful deserts of Jaisalmer, Jodhpur or Jaipur. Glaring into the endless sea of sand and watching the sun go down as you slowly ride yourself across sand dunes on the back of the camel is something you certainly look forward to in a desert. Riding a camel may be scary but in reality, it is as smooth as anything else. Getting on & off might be a bit of a hassle but otherwise the camel is a comfortable being to hold on to. Crystal clear water all around and sitting on traditional Indian boat. Just take a deep breathe and listen to the sound of water and feel the beauty of the nature – the out of the world experience. Feel these vibes of water at Varanasi in one and only Ganges river you can say it holy ride too. 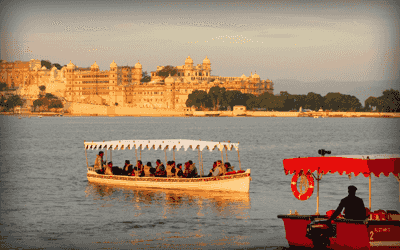 Udaipur is also waiting you to treat you with a joyous boat ride experience in its awe beauty river Lake Pichola. So have fun boat ride in India! 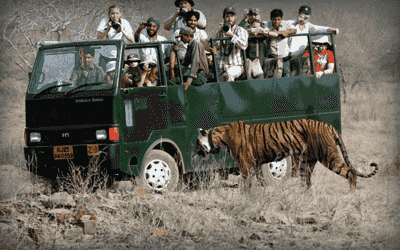 The scintillating tiger and forest reverses of India make the jungle safari a must in the beautiful sanctuaries of Ranthambore (Rajasthan), Panna (Madhya Pradesh), Bandhavgarh (Madhya Pradesh), Pench (Maharashtra) and many more. The thrill seekers exclusively take pleasure in the sighting of tigers, deers and other forms of wildlife, more because of the observation of creatures in their natural habitat. Indian woods are the hub of adventure trips for every traveller. Jungle Safari is major attraction and one of the most popular options to spot animal movement and admire beautiful landscape in wildlife parks. The only transportation system that gives you affordable and in depth access to every nook of the country is undoubtedly the Indian railways. A total of above 7500 passenger trains operate across the nation taking you into the most profound of regions in rural as well as urban areas. The reason for railway preference also lies in the adaptability of trains to one’s budget. From the non-ac coaches to the supreme ac ones, you can opt for any ticket that suits your travel. Although the common belief of delay in train operations seems to be fair to some extent, the situation is improving widely with new trains coming in the forum especially the shatabdis, rajdhanis. The recent commencement of the luxury coaches like golden chariot, maharajas express, palace on wheels has really given a boost to the railway structure. The travellers are provided 5 star facilities within the train and are taken throughout the nation with marvellous services. The nature of India’s stretch has led to the growth of a diverse number of cuisines and tastes in all parts of the country. From the Rajasthani dishes (Dal Baati churma, rabdi, gatte), gujarati jabeli & phaphda, south indian idli & dosa, goan kokum & sea food and Mumbai vada pao, all cater to completely different sects of the nation. 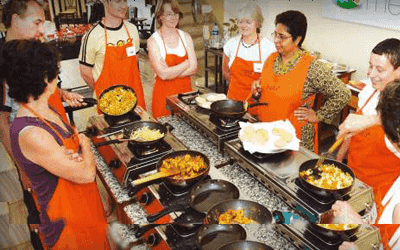 Visitors get the once in a lifetime chance of experimenting with the magic of their hands and cooking the diverse dishes while being overlooked by masterchefs in every city and state. More than the knowledge, it is the joyous experience of preparing complicated traditional Indian cuisines. 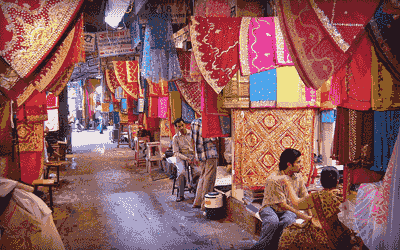 Unravel the vibrant colours of Jaipur and drown yourself in the beauty of old monuments, spicy street foods and the traditional markets by joining us in the Jaipur walking tours where we take you deep into the cultures of the pink city. The bustling streets of Jaipur and the colourful sculptures await your visits and admiration as we set off on our journey to explore this city of various facets. When it comes to wellness, ‘Yoga’ hits the mind and attracts soul and when ‘Yoga’ comes to mind, India comes to heart as India is origin of YOGA. Yoga takes care of mind, body and soul so it’s more than worthy to pay a visit to India for SOUL purpose yoga. Listen to the sound of your spirit and pack your backpacks and come India to enhance your mind’s power after practicing magical yoga. India deserves a visit for this large transformation of your individual being.